The Cameron School District Comet Club program is designed to provide a safe, supervised, fun, and enriching environment before and after school for children in grades Pre-K through 6th grade. The program is available only on days when school is in session from 6:00 a.m.–8:00 a.m. and 3:15-6:00 p.m. Drop-in care is available for pre-registered families. See “Drop-In Care” on page 7 for more details. 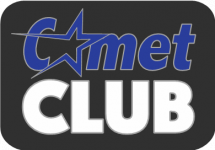 You must be pre-registered to attend Comet Club. Comet Club is also available for Wrap-Around care for All Aboard students. The hours of care for the Wrap-Around program are 8:00a.m.-12:00p.m. and 11:00a.m.-3:00p.m. (opposite of their All Aboard session). If you need childcare before &/or after school, your child may attend the Before & After School Comet Club program. To provide a safe, healthy, and supervised environment for children in grades Pre-K-6 from 6:00 a.m. -8:00 a.m. and from 3:15 p.m. - 6:00 p.m.
To provide opportunities for exercise through indoor and outdoor playground games and free play. To provide increased opportunities for academic achievement with time devoted to homework help, study time, quiet reading time, and music time. To provide nutrition with healthy after-school snacks and participation in the school breakfast program. To provide enrichment through arts and crafts projects; dramatic, sensory, and imaginative play; board games; computer and music time; and time devoted to exploring new interests. To provide opportunities for character development, service learning, and life skills.